There’s a chill in the air, a crisp morning breeze, trees are bursting with gold and russet leaves – Autumn is here. Believe it or not, now is the time to plant as great gardens begin in Autumn. 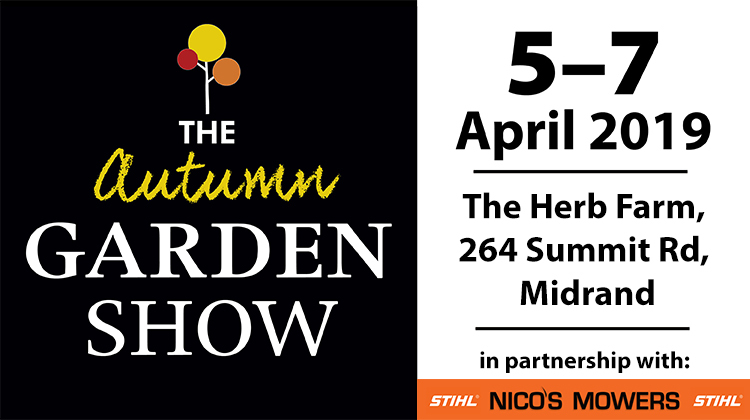 What better way to celebrate this inspiring season than to visit The Autumn Garden Show, which returns for its second year at The Herb Farm, Summit Road, Midrand from 5 – 7 April 2019. Take a stroll through the picturesque herb garden, a vibrant celebration of the senses with bursts of colours of roses and blooms and the heady scents of herbs. Enjoy an educational Herb Tour through the spiral labyrinth garden, taste heirloom tomatoes in a variety of colours from every corner of the globe and admire the spectacular orchids on display. Explore the shopping avenues filled with plants, crafts and gardening goodies and stop for a spot of lunch, a botanical gin or a cup of tea in an enchanting setting. Bring the kids along for a fun-filled day where they can play on jungle gyms, do an obstacle course and enjoy a pony ride through the garden. Presented by The Gardener, Die Tuinier, Grow to Eat, Let’s Braai, Kom ons Braai and Open Gardens of South Africa magazines in conjunction with The Herb Farm and Nico’s Mowers, this family event is the perfect way to Fall into Autumn!